Custom residential remodeling pro Matt Weber, owner of Crossgrain in Union, Missouri, recently specified LUXE Linear Drains to help complete a special project including a new master bath shower for a family with an aging adult that wishes to remain living at home on their beautiful, sprawling farm just outside St. Louis. With the family matriarch beginning to struggle more and more to get around the house, particularly up the stairs to the master bedroom, Weber and his team were tasked with creating a plan to remodel one corner of the farmhouse’s first floor into a new master bedroom suite complete with a full closet and custom shower. With the shower being the main focal point concerning her safety, Weber specified LUXE Linear Drains in order to create a curbless, easily accessible shower that proved to be the ideal solution for the most critical safety component of the new bath. By selecting the LUXE Stainless Steel Square Tile Insert Drain, Weber was able to design a truly stylish, zero-threshold entry shower that allows the homeowner to easily and safely enter and exit the shower using her cane, walker or wheelchair, eliminating what is by far the most challenging aspect for any adult that chooses to age at home. And while Crossgrain absolutely delivered on the critical safety component of the new custom shower for the new downstairs master bedroom suite, this project also helps showcase several of the key benefits offered by specifying LUXE Linear Drains. LUXE Linear Drains are ideal for designing showers with porcelain tile and the tile insert drain option helps create an uninterrupted tile surface design. Weber used the ultra-popular wood-look porcelain tile planks in random lengths for the main floor of the bath that seamlessly transitions to the shower floor where he chose an earthen blend of 2” x 2” mosaics. Weber used the same mosaics as the insert tiles for the 5” x 5” LUXE Stainless Steel Square Tile Insert Drain to complete his continuous pattern for the shower floor. Weber completed the shower design with soft white, 3” x 6” subway style porcelain tiles that surface all three shower walls. In addition, the entire LUXE Linear Drains collection has been manufactured to be independent of any specific waterproofing membrane, installation materials or methods. This allows the contractor to work with their preferred materials for fast, easy installations and optimal results. In fact, LUXE Linear Drains can simply replace the strainer and flange in most standard shower projects. This was another benefit that Weber took full advantage of for this special project. 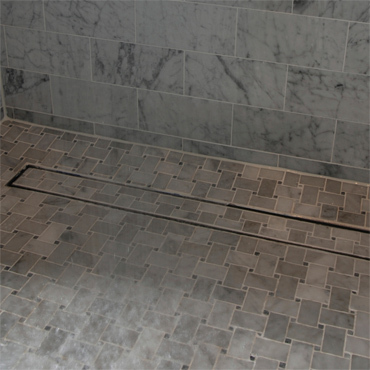 With the shower build complete, the plumber for the project had installed a drain collar and brought a traditional steel drain grate to the project. 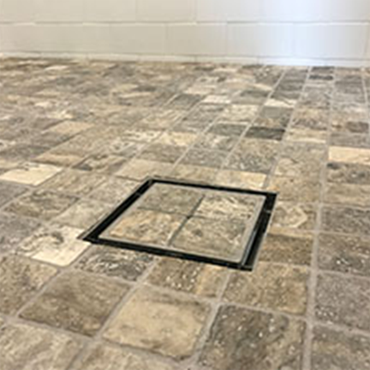 After discovering the LUXE Linear Drains in the final stages, Weber was able to unscrew what the plumber had used and easily slide the LUXE Stainless Steel Square Tile Insert Drain in place to complete the shower drain. LUXE Linear Drains is a U.S. veteran-owned producer of architectural-grade, 100% stainless steel modern design linear and tile insert shower drains. The multi-award winning collection of low-profile linear decorative wedgewire, pattern grate and tile insert drains have inspired architects, interior designers and craftsman to achieve a wide-range of stylish, contemporary custom shower designs in private homes and prestigious building projects worldwide. Product information and sales related request please contact President Joe Phillips at joe@luxelineardrains.com or call 877.398.8110. LUXE Linear Drains, P.O. Box 8064, Atlanta, Georgia 31106.